As you might have heard, I’ll be retiring in June 2018 and, with leave, my last working day will be 31 May – and that means this will be my last blog post. It marks the end of a 33-year career at the agency, which has been both challenging and rewarding. I’ve covered many driving examiner management roles from test centre manager to head of operations and also spent many a happy day at Cardington as a proud member of the training team. Leaving as Head of Policy and Chief Driving Examiner, I've achieved more than I ever imagined I would when I joined back in 1985 as one of the few female examiners at that time. I've worked with some wonderful people, many of whom, past and present, came to share my retirement celebration last week. It was a fantastic night and I was overwhelmed and humbled by the comments in a lovely memory book together with the generous gifts I received. While I know I will quickly recover from the need to go to work, I will miss those people greatly. My impending retirement also got me thinking (as most major changes in life do) about what I’ve achieved and what I’m proud of. In the 83-year history of the driving test, becoming the first female Chief Driving Examiner felt like a huge achievement. Lesley is proud of having had the opportunity to represent our work in the media. 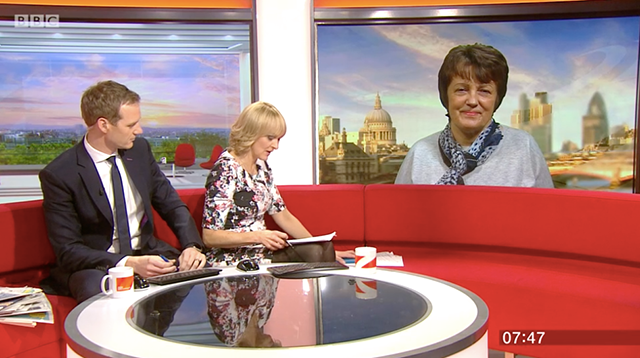 Here she is on BBC Breakfast talking about changes to the driving test. So while I will not be at DVSA to see this last point right through, I'm delighted that I was able to play my part in delivering a promise to our driving examiners to provide modern technology to help them all in their working lives. So now everyone has an iPad and can at last communicate independently. I hope it will not be long before many more features are available and all tests are recorded electronically. This is a major achievement that was made possible by huge cooperation and hard work between directorates. It shows that this agency will deliver on its promises to ensure that our frontline staff have the best equipment to support them in their work. I’ve been the Chief Driving Examiner since 2012, providing professional advice and direction to all our driving examiners. Leadership is a privilege. You can only lead with the support of a team – and the team at DVSA is brilliant. They’re dedicated, determined, talented and care about road safety. It’s been an honour and a pleasure to work with them all. I’m leaving the role of Chief Driving Examiner in more than capable hands. Mark Winn, currently Deputy Chief Driving Examiner, will become the new Chief Driving Examiner from Monday 4 June 2018. I wish him every success for the future – he will have plenty to keep him busy, not least all the complexities of automated vehicles. 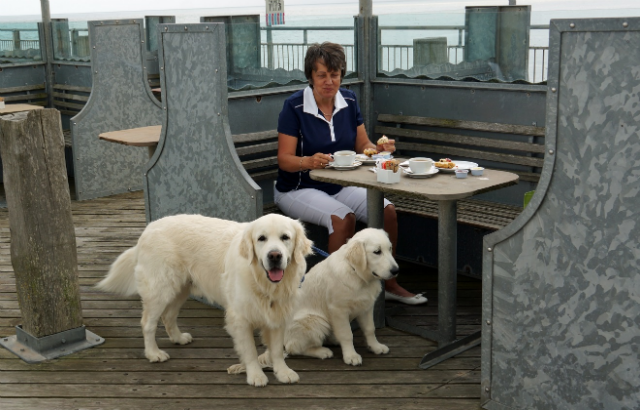 With the golf course beckoning, I'm looking forward to living life at a more relaxed pace and spending more time with my husband, Brian, and our 2 dogs, Rosie and Ollie (cream teas at the seaside!). In closing, my thanks to each and every one of you. The work you do doesn’t always get the credit it deserves – but it’s vital. Here's to a lifetime of safe driving, and I wish you all the best for the future. Wishing you all the best in your retirement. Enjoy your family and friends, and find things to do that you want to do. Best wishes for a long and happy retirement. Glad to have been part of your team. Well done for all your hard work and dedication with the DVSA, I hope you have a wonderful retirement and enjoy quality time with your husband and those gorgeous dogs of yours. Best wishes on your retirement, I'm sure Brian and the dogs will keep you busy. Seems a long time ago we worked together in Taunton and Nottingham. Hope you have a long and happy retirement. Fantastic career, well deserved retirement. Enjoy now spending quality time with your family. I'm sure you've done as well as anyone can and I wish you a long happy and healthy retirement. But in the real world of teaching new drivers, many of whom have parents that simply view us Adi's as only there to take people to their test. After all there is still no mandate to use any professional instructor, giving many parents the message that we are an expensive luxury. I've attached a recent report from an ADI that is far from being unusual. The fault in our system is that we are not held in high regard and although DVSA makes efforts to improve all aspects of teaching and testing, the fact that there is no mandate, means the message remains "The school of Mum & Dad is sufficient".
" I know there has been recent posts lately, about parents, wanting to book tests for their children when they aren’t ready, after today I’m really had enough. Arrive at pupils house, mum comes out, says he will be late he’s only just got up 5 minutes ago, his lesson was at 2.30pm, I’m going to book his practical test she said, he’s not ready I replied, he has only done 5 one and half hour lessons this year, but he’s done plenty of driving she said, where I ask, up and down the main roads, was the reply, so not in town I ask, no she says I won’t take him in town I’m not confident enough with his driving, but you think he’s test ready I ask, well his Theory runs out in 6 weeks, well he needs to do lessons properly and not now and again I said. He turns up 2.50pm. Only dual controlled him 3 times during lesson, once for turning right at traffic lights, not giving way to on coming traffic, once for not noticing person on zebra crossing, once for not looking right on roundabout car coming, also approaching pedestrian crossing on flashing amber,suddenly slams brakes on, no one on crossing, why did you do that I ask, because they are going to go to red was the reply,are you sure about that I ask, yes was the reply, then he notices they go to green, oh wasn’t expecting that he said, why not I asked that’s the next colour after flashing amber isn’t it. Back to his house mum comes out, your back early? No I said, back at the time the lesson was meant to finish, if he’s not ready at the time he should be, then it’s his time his wasting, not mine, I have another lesson to get to. How did he do, his mum asks, well he’s certainly not ready for a test, I said and he needs to do regular lessons not just now and again, also told her the things that went wrong, and why don’t you sit in the back next lesson and see for yourself, I’m not going to do that was the reply, it’s to scary with him driving, so why are you insisting on booking a test then, when you know he’s not ready, I’m sorry at times he’s just dangerous I said, he just doesn’t concentrate enough on what he’s doing, and what is around him. But I said if you want to book a test you can, but it won’t take place in my car, unless there is a vast improvement, otherwise you can take him in yours. We will see what happens". Brilliant post, a real eye opener, not sure this was the right place for it, but a worthwhile insight nonetheless. Wish you all the best. Mohammed. Maroof. Dvsa adi. Thank you for all that you have done and for inspiring us to continue in your what you have made happen. All the best for your retirement. Thank you for the great work you did to keep our roads safe and all the very best for the future. Enjoy the quieter life. Happy retirement. Wishing you a wonderful happy and long Retirement. Lesley, may your retirement be a long, healthy and happy adventure. Thanks for whatever you have done in regards of safety on the roads ! Wish you a long healthy life and relaxing retirement. I have many fond memories of the times we trained new entrants at Cardington Lesley, we always made training enjoyable as much as we could. Sorry that Kim and I could not make it to your party, all the very best for the future for you and Brian. Thank you for all your help, support and encouragement over the past 20 years +, Here's wishing you and Brian a long, happy and healthy retirement together on and off the golf course. It seems a hige journey since knowing you in the 90's at both Taunton and Yeovil Lesley. I still remember those days with a smile. You've made great progress in updating the ageing system we knew back then. There will always be more alterations; it's a shame, in some ways, you won't be the one to oversee them. Wishing you and Brian all the best and a happy retirement together. It seems a very long time ago since I was an ADI and you were a DE at Clifton Bristol. A lot of water has gone under the bridge since then during which time when our paths have crossed it has always been a pleasure to see you. Enjoy the golf, very best wishes to yourself and Brian. In our fast moving world, it is quite an achievement to reach retirement age. Regarding this Blob. The honest response has got to be that it can only be left to the opinion of each individual. On behalf of the members of the Motor Schools Association of Great Britain throughout the Western region we would like to wish you and Brian a long and healthy retirement. Thank you for all your help and advice during your time from examiner to management in this region. Wishing you a very happy retirement thanks for all your support may God give you healthy life and spend valuable time with family God bless you.